For the soundtrack album, see A Charlie Brown Christmas (soundtrack). Peanuts had become a phenomenon worldwide by the mid-1960s, and the special was commissioned and sponsored by The Coca-Cola Company. It was written over a period of several weeks, and animated on a shoestring budget in only six months. In casting the characters, the producers went an unconventional route, hiring child actors. The program's soundtrack was similarly unorthodox: it features a jazz score by pianist Vince Guaraldi. Its lack of a laugh track (a staple in US television animation in this period), in addition to its tone, pacing, music, and animation, led both the producers and the network to predict the project would be a disaster ahead of its broadcast. Contrary to that apprehension, A Charlie Brown Christmas received high ratings and acclaim from critics. It has since been honored with both an Emmy and a Peabody Award. It became an annual broadcast in the United States, and has traditionally been aired during the Christmas season every year since its premiere. Its success paved the way for a series of Peanuts television specials and films. Its jazz soundtrack also achieved commercial success, selling 4 million copies in the US. Live theatrical versions of A Charlie Brown Christmas have been staged. ABC currently holds the rights to the special and broadcasts it at least twice during the weeks leading up to Christmas. The Peanuts are celebrating the start of the winter season by ice skating on a frozen pond and singing "Christmas Time Is Here." Leaning against a nearby fence, Charlie Brown tells Linus that despite all the traditions of Christmas presents, Christmas cards and decorations, he still winds up depressed, but is not sure why. Linus dismisses Charlie Brown's attitude as typical, quoting Lucy: "Of all the Charlie Browns in the world, you're the Charlie Browniest." Charlie Brown's depression is only made worse by the goings-on in the neighborhood, most of which show his peers' rampant commercialism. He encounters Violet and sarcastically "thanks" her for the Christmas card he never received, only for Violet to proudly snipe back that she never sent him one. At the psychiatric booth, Lucy expresses joy in the sound of jingling money, tries to diagnose Charlie Brown with various phobias, admits she never receives her Christmas wish of real estate, and ultimately decides that Charlie Brown needs more involvement. Lucy recommends that Charlie Brown direct an upcoming Christmas play and offers to help him do so; Charlie Brown jumps at the opportunity to have a leadership role. At Snoopy's doghouse, Charlie Brown is further disgusted when he finds out that his dog has entered the doghouse into a lights and display contest with a cash prize. He is finally accosted by his sister Sally, who asks him to write her letter to Santa Claus. When she hints at having an extremely long and specific list of requests, and says she will accept large sums of money as a substitute ("tens and twenties"), Charlie Brown becomes even more dismayed and runs off. Charlie Brown arrives at the rehearsal, but he is unable to gain control of the situation, since everyone in the play has their own complaints and would rather dance along to the jazz-rock band (consisting of Schroeder on keyboards, Snoopy on an inaudible electric guitar and Pig-Pen on bass) as they play "Linus and Lucy." The play is a quite modern one, with an upbeat jazz score, a "Christmas queen," shepherds, innkeepers and penguins but no identifiable Biblical figures. A displeased Charlie Brown decides the play needs "the proper mood" and suggests they should get a Christmas tree. Lucy instructs him, and the accompanying Linus, to get an aluminum Christmas tree that is big, shiny and pink from a nearby tree lot. 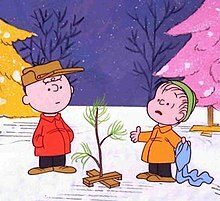 When they get to the lot, filled with numerous trees fitting Lucy's description, Charlie Brown ironically and symbolically chooses the only real tree there (in disbelief that wooden Christmas trees still exist)—a tiny sapling that is rapidly shedding needles. Linus is unsure about Charlie Brown's choice, but Charlie Brown is convinced that all it needs is some decoration and it will be just right. While those two get the tree, Schroeder tries to pass off "Für Elise" as a Christmas song, as Lucy tries to get him to play the perfect rendition of "Jingle Bells;" after two failed attempts (piano and organ), Schroeder tersely pecks the keys on his toy piano, which is exactly what Lucy seeks. Linus and Charlie Brown return to the auditorium with the tree; Lucy promptly lectures Charlie Brown for disobeying her instructions while the other girls, along with Snoopy, mock him and walk off laughing. At his wit's end, Charlie Brown loudly asks if anybody knows what Christmas is all about. Linus says he does and, after walking to center stage and cuing the spotlight, recites the annunciation to the shepherds passage (Luke 2:8-14) from the King James Bible. After a brief pause, Linus turns and says: "That's what Christmas is all about, Charlie Brown." Charlie Brown quietly picks up the tree and walks out of the auditorium toward home, now determined not to let commercialism ruin the holiday. He stops at Snoopy's decorated doghouse, which now sports a blue ribbon for having won the display contest. He takes a large ornament from the doghouse and hangs it at the top of his tree, but the branch, seemingly unable to hold the ornament's weight, promptly droops to the ground. Believing he has killed the tree and that he has ruined everything as usual, Charlie Brown walks off in despair. Linus and the others, realizing they were too hard on Charlie Brown, quietly follow him to Snoopy's doghouse. Linus admits he always liked the tree while gently propping the drooping branch back in its upright position and wraps his blanket around its base, and when the others add the remaining decorations from Snoopy's doghouse to the tree, Lucy agrees. They start humming "Hark! The Herald Angels Sing". Charlie Brown returns, surprised at the humming and the redecorated tree, and the gang all joyously shout "Merry Christmas, Charlie Brown!" They all begin to sing "Hark! The Herald Angels Sing," and Charlie Brown joins them as the special ends. Children's vocals for the songs "Christmas Time is Here", "Hark! The Herald Angels Sing" and when the kids all shout "Merry Christmas, Charlie Brown" were performed by members of the choir of St. Paul's Episcopal Church in San Rafael, California. Several months before the making of A Charlie Brown Christmas this choir was featured on the Vince Guaraldi recording "Vince Guaraldi at Grace Cathedral." The characters named "5", "3", and "4" have cameo appearances but are silent. By the early 1960s, Charles M. Schulz's comic strip Peanuts had become a sensation worldwide. Television producer Lee Mendelson acknowledged the strip's cultural impression and had an idea for a documentary on its success, phoning Schulz to propose the idea. Schulz, an avid baseball fan, recognized Mendelson from his documentary on ballplayer Willie Mays, A Man Named Mays, and invited him to his home in Sebastopol, California, to discuss the project. Their meeting was cordial, with the plan to produce a half-hour documentary set. Mendelson wanted to feature roughly "one or two" minutes of animation, and Schulz suggested animator Bill Melendez, with whom he collaborated some years before on a spot for the Ford Motor Company. Mendelson later stated that he was drawn to doing an animated Charlie Brown after working on A Man Named Mays, noting that Mays was arguably the best baseball player of all time, while Charlie Brown, in a running gag in the strips, was one of the worst, making him a natural follow-up subject to his previous work. Despite the popularity of the strip and acclaim from advertisers, networks were not interested in the special. By April 1965, Time featured the Peanuts gang on its magazine cover, perhaps prompting a call from John Allen of the New York-based McCann Erickson Agency. Mendelson imagined he would sell his documentary, and blindly agreed to Allen's proposal: an animated half-hour Peanuts Christmas special. The Coca-Cola Company was looking for a special for advertising during the holiday season. "The bad news is that today is Wednesday and they'll need an outline in Atlanta by Monday," Allen remarked to Mendelson. He quickly contacted Schulz, and the duo got to work with plans for a Peanuts Christmas special. The duo prepared an outline for the Coca-Cola executives in less than one day, and Mendelson would later recall that the bulk of ideas came from Schulz, whose "ideas flowed nonstop." According to Mendelson, their pitch to Coca-Cola consisted of "winter scenes, a school play, a scene to be read from the Bible, and a sound track combining jazz and traditional music." The outline did not change over the course of its production. As Allen was in Europe, the duo received no feedback on their pitch for several days. When Allen got in touch with them, he informed them that Coca-Cola wanted to buy the special, but also wanted it for an early December broadcast, giving the duo just six months to scramble together a team to produce the special. Mendelson assured him – without complete confidence in his statements – that this would be no problem. Following this, A Charlie Brown Christmas entered production. Charles M. Schulz in 1956. His goal for the special was to focus on the true meaning of Christmas. Schulz's main goal for a Peanuts-based Christmas special was to focus on the true meaning of Christmas. He desired to juxtapose this theme with interspersed shots of snow and ice-skating, perhaps inspired by his own childhood growing up in St. Paul, Minnesota. He also created the idea for the school play, and mixing jazz with traditional Christmas carols. Schulz was adamant about Linus' reading of the Bible, despite Mendelson and Melendez's concerns that religion was a controversial topic, especially on television. Melendez recalled Schulz turned to him and remarked "If we don't do it, who will?". Schulz's estimation proved accurate, and in the 1960s, less than 9 percent of television Christmas episodes contained a substantive reference to religion, according to university researcher Stephen Lind. It could also be worth noting that Linus's recitation of Scripture was incorporated in such a way that it forms the climax of the film, thus making it impossible to successfully edit out. Schulz's faith in the Bible stemmed from his Midwest background and religious and historical studies; as such, aspects of religion would be a topic of study throughout his life. According to a 2015 "spiritual biography", Schulz's religion was personal and complex, and would be integrated in a number of his programs. The program's script has been described as "barebones", and was completed in only a few weeks. In the days following the special's sell to Coca-Cola, Mendelson and animator Bill Melendez met with Schulz in his home to expand upon the ideas promised in the pitch. Mendelson noted that on the previous Christmas Day he and his spouse had read Hans Christian Andersen's "The Fir-Tree" to their children. Schulz countered with the idea that there be a tree with the spirit of lead character Charlie Brown. Mendelson suggested they employ a laugh track, a staple of television animation, but Schulz rejected this idea immediately. He felt strongly that the audience should not be informed on when to laugh. They spoke at length about creating an official theme that was neither jazz nor traditional to open the program. Schulz wanted a part of the special to feature the character of Schroeder performing Beethoven, and Mendelson combined this with the inclusion of Guaraldi's "Linus & Lucy" number. Schulz penned the script for A Charlie Brown Christmas, with Melendez plotting out the animation via a storyboard. His storyboard contained six panels for each shot, spanning a combined eighty or-so pages. In casting the silent comic strip characters of Peanuts, the trio pulled from their personalities. Lead character Charlie Brown's voice was decided to be downbeat and nondescript ("blah," as Mendelson noted), while Lucy be bold and forthright. Linus' voice, it was decided, would combine both sophistication with childlike innocence. Mendelson recognized that the character of Snoopy was the strip's most popular character who seemed to seize "the best jokes," but realized they could not cast a voice for the cartoon dog. "In the process, we gained a veritable 'canine Harpo Marx,'" Mendelson later wrote. Melendez suggested he provide gibberish for Snoopy's mutterings, and simply speed up the tape to prevent viewers from knowing. There are no adult characters in the strip or in this special. Later specials would introduce an offscreen teacher; her lines are eschewed for the sound of a trombone as the team behind the specials found it humorous. With this in mind, the trio set out to cast the characters, which proved to be a daunting process. Casting for Charlie Brown proved most difficult, as it required both good acting skills but also the ability to appear nonchalant. The producers picked eight-year-old Peter Robbins, already known for his roles spanning television, film, and advertisements. His godmother, famous Hollywood agent Hazel McMillen, discovered Christopher Shea, who would become Linus in the special. His slight lisp, according to Mendelson, gave him a "youthful sweetness," while his emotional script reading "gave him power and authority as well." Tracy Stratford played the role of Lucy, with the creators being impressed by her attitude and professionalism. Kathy Steinberg was the youngest of the performers, just six years old at the time of recording. Too young to read, the producers had to give her one line at a time to recite. Robbins remembered Melendez did this for him as well, joking that he also mistakenly copied his Latino accent. Mendelson desired to have non-actors (not "Hollywood kids") perform on the special, and he sent tape recorders home with his employees for their children to audition. The soundtrack to A Charlie Brown Christmas is an unorthodox mix of traditional Christmas music and jazz. The jazz portions were created by the Vince Guaraldi Trio. Producer Lee Mendelson, a fan of jazz, heard Guaraldi's crossover hit "Cast Your Fate to the Wind" on the radio not long after completion of his documentary Charlie Brown & Charles Schulz, and contacted the musician to produce music for the special. Guaraldi composed the music for the project, creating an entire piece, "Linus and Lucy," to serve as the theme. When Coca-Cola commissioned A Charlie Brown Christmas in spring 1965, Guaraldi returned to write the music. The first instrumentals for the special were recorded by Guaraldi at Glendale, California's Whitney Studio with bassist Monty Budwig and drummer Colin Bailey. Recycling "Linus and Lucy" from the earlier special, Guaraldi completed two new originals for the special, "Skating", and "Christmas Time Is Here". In the weeks preceding the premiere, Mendelson encountered trouble finding a lyricist for Guaraldi's instrumental intro, and penned "Christmas Time is Here" in "about 15 minutes" on the backside of an envelope. The special opens and closes with a choir of children, culled from St. Paul's Episcopal Church in San Rafael, California, performing "Christmas Time Is Here" and "Hark! The Herald Angels Sing". One of the singers, Candace Hackett Shively, went on to become an elementary school teacher, and sent a letter of gratitude to Schulz after he announced his retirement in 2000. In the letter, she recalls recording the choir at Fantasy Studios and going out for ice cream afterwards, while also noting that she tells the story to her grade-schoolers each holiday season. The recording sessions were conducted in late autumn 1965, and were cut in three separate sessions over two weeks. They often ran late into the night, resulting in angry parents, some who forbade their children from returning; consequently, numerous new children were present at each session. The children were directed by Barry Mineah, who demanded perfection from the choir. Mendelson and Guaraldi disagreed, desiring the "kids to sound like kids"; they used a slightly off-key version of "Hark! The Herald Angels Sing" in the final cut. Children were paid five dollars for their participation. In addition, the children recorded dialogue for the special's final scene, in which the crowd of kids shout "Merry Christmas, Charlie Brown!" 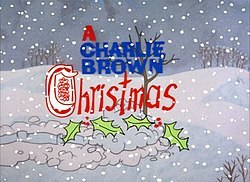 A Charlie Brown Christmas was voted into the Grammy Hall of Fame in 2007, and added to the Library of Congress's National Recording Registry list of "culturally, historically, or aesthetically important" American sound recordings in 2012. A Charlie Brown Christmas was completed just ten days shy of its national broadcast premiere. All involved believed the special would be an unmitigated disaster. Melendez first saw the completed animation at a showing in a theater in the days before its premiere, turning to his crew of animators and remarking, "My golly, we've killed it." Melendez was embarrassed, but one of the animators, Ed Levitt, was more positive regarding the special, telling him it was "the best special [he'll] ever make [...] This show is going to run for a hundred years." Mendelson was similar in his assumptions of the show's quality, and when he showed the film to network executives in New York, their opinions were also negative. Their complaints included the show's slow pace, the music not fitting, and the animation too simple. "I really believed, if it hadn't been scheduled for the following week, there's no way they were gonna broadcast that show," Mendelson later said. Executives had invited television critic Richard Burgheim of Time to view the special, and debated as to whether showing it to him would be a good idea. His review, printed the following week, was positive, praising the special as unpretentious and writing that "A Charlie Brown Christmas is one children's special this season that bears repeating." The program premiered on CBS on December 9, 1965, at 7:30 pm ET (pre-empting The Munsters), and was viewed by 45% of those watching television that evening, with the number of homes watching the special an estimated 15,490,000, placing it at number two in the ratings, behind Bonanza on NBC. The special received unanimous critical acclaim: The Hollywood Reporter deemed the show "delightfully novel and amusing," while the Weekly Variety dubbed it "fascinating and haunting." Bob Williams of the New York Post praised the "very neat transition from comic page to screen," while Lawrence Laurent of The Washington Post declared that "natural-born loser Charlie Brown finally turned up a real winner last night." Harriet Van Horne of the New York World-Telegram hailed the scene in which Linus recites scripture, commenting, "Linus' reading of the story of the Nativity was, quite simply, the dramatic highlight of the season." Harry Harris of The Philadelphia Inquirer called the program "a yule classic [...] generated quiet warmth and amusement," and Terrence O'Flaherty of the San Francisco Chronicle wrote, "Charlie Brown was a gem of a television show." Ben Gross of the New York Daily News praised the special's "charm and good taste," while Rick DuBrow of United Press International predicted, "the Peanuts characters last night staked out a claim to a major television future." Although originally broadcast on the CBS network from 1965 until December 25, 2000, in January 2000, the broadcast rights were acquired by ABC, which is where the special currently airs, usually twice, in December. The original broadcasts included references to the sponsor, Coca-Cola. Subsequent broadcasts and home media releases have excised all references to Coca-Cola products. Later subsequent broadcasts of the special also had some scenes, animation, including sound effects being redone for correction. Snoopy's dog bowl was given a new color, Lucy now makes a whirling noise when scared out of her psychiatric booth, new animation was placed in scenes where the children dance on stage after the first time to avoid repetition, music was added in the background of the rehearsal scenes, and Snoopy no longer sings like a human in the final carol. The show's 40th anniversary broadcast on December 6, 2005, had the highest ratings in its time slot. The 50th anniversary broadcast aired on November 30, 2015, and it featured a full two-hour time slot that was padded by a special, It's Your 50th Christmas, Charlie Brown, which was hosted by Kristen Bell, and featured musical performances by Kristin Chenoweth, Matthew Morrison, Sarah McLachlan, Boyz II Men, Pentatonix, David Benoit, and the All-American Boys Chorus. It also included documentary features. In 1987 the special was released on VHS by Hi-Tops Video. In 1992, the special was released for a limited time on VHS through Shell Oil for sale at their gas stations. On October 6, 2009, it was released in high definition Blu-ray Disc from Warner in remastered Dolby 5.1 surround sound. This disc also contains It's Christmastime Again, A Christmas Miracle, a DVD of the special, and a Digital Copy. Since off-network rights to this special have been transferred to Warner Bros., it has become available as a download on the iTunes Store, PlayStation Network, Amazon Instant Video, and Google Play, and includes It's Christmastime Again, Charlie Brown and It's Flashbeagle, Charlie Brown. In December 2014, a 50th anniversary 2-DVD set was released. It also features the special It's Christmastime Again, Charlie Brown, and the Making of... documentary from previous editions. On October 31, 2017, it was released on 4K UHD Blu-ray disc containing It's Christmastime Again, Charlie Brown and the Making of... special. The special influenced dozens of young aspiring artists and animators, many of whom went on to work within both the comics and animation industries, among them Eric Goldberg (Pocahontas), Pete Docter (Monsters, Inc., Up), Andrew Stanton (Finding Nemo, WALL-E), Jef Mallett (Frazz), and Patrick McDonnell (Mutts). The show's score made an equally pervasive impact on viewers who would later perform jazz, among them David Benoit and George Winston. More directly, the special launched a series of Peanuts films, TV specials (many of them holiday-themed) and other works of entertainment. Linus' speech near the end of the special was used in the Sidewalk Prophets Christmas song "What a Glorious Night". In 2013 Tams-Witmark Music Library, Inc. began licensing an official stage version of the television special authorized by the Schulz family and Lee Mendelson. The stage version follows the television special but includes an optional sing-along section of Christmas songs at the end. It includes all of Vince Guaraldi's music from the television special and the television script is adapted for the stage by Eric Schaeffer. It has been performed at hundreds of schools, churches and community theatres. The popularity of the special practically eliminated the popularity of the aluminum Christmas tree, which was a fad from 1958 to 1965, when the special portrayed it negatively. By 1967, just two years after the special first aired, they were no longer being regularly manufactured. The "Charlie Brown Christmas Tree" has been used to comedic effect with people familiar with the special and has become synonymous with poorly executed or minimalist Christmas decorating. A model of the tree is offered by various retailers. Three lesser-known Christmas specials were produced decades after the 1965 original. It's Christmastime Again, Charlie Brown (1992). This special was 30 minutes in length with commercials and aired on CBS. It was abandoned by CBS shortly thereafter; it was released on DVD as a bonus feature with A Charlie Brown Christmas. I Want a Dog for Christmas, Charlie Brown (2003) This special is a full hour long with commercials and debuted on ABC. It is available on DVD. ^ a b c d e Solomon 2013, p. 11. ^ a b c d e f g h i j k l m n o Whoopi Goldberg, Lee Mendelson et al. (2004). The Making of A Charlie Brown Christmas (DVD). Paramount Home Entertainment. ^ Mendelson 2013, p. 11. ^ a b Mendelson 2013, p. 12. ^ Greilsamer, Marc (November 1997). "Life After Snoopy". Stanford Alumni Magazine. ^ a b c Mendelson 2013, p. 14. ^ Mendelson 2013, p. 15. ^ a b c d e f Mendelson 2013, p. 17. ^ a b c Mendelson 2013, p. 19. ^ a b c d e f John Kiesewetter (December 11, 2000). "'A Charlie Brown Christmas' almost didn't get made". The Cincinnati Enquirer. Retrieved September 19, 2014. ^ Templeton, David. My Lunch with Sparky, reproduced from the December 30, 1999 – January 5, 2000 issue of the Sonoma County Independent. Archived November 28, 2008. ^ a b c d e f Nichols, Bill (December 5, 2005). "The Christmas Classic That Almost Wasn't". USA Today. Retrieved February 12, 2012. ^ a b c d e Mendelson 2013, p. 20. ^ a b c d e f g h i Mendelson 2013, p. 21. ^ a b Mendelson 2013, p. 24. ^ Mendelson 2013, p. 22. ^ a b c d e f Mendelson 2013, p. 23. ^ Mendelson 2013, p. 59. ^ a b Mendelson 2013, p. 57. ^ a b Bang 2012, p. 176. ^ a b c Bang 2012, p. 187. ^ a b c Bang 2012, p. 188. ^ Grein, Paul (January 4, 2012). "Week Ending Jan. 1, 2012. Albums: She's Back". Yahoo! Music. Nielsen Business Media. Retrieved January 5, 2012. ^ "The National Recording Registry 2011". National Recording Preservation Board of the Library of Congress. Library of Congress. May 24, 2012. ^ Burgheim, Ronald (December 10, 1965). "Security Is a Good Show". Time. New York City: Time Inc. 86 (24). ISSN 0040-781X. ^ "St. Petersburg Times - Google News Archive Search". ^ a b c Bang 2012, p. 191. ^ a b c Mendelson 2013, p. 32. ^ Mendelson 2013, p. 33. ^ a b c Bang 2012, p. 190. ^ "YouTube: Original main title sequence to A Charlie Brown Christmas with sponsor tag". June 26, 2013. ^ "YouTube: Original end title sequence to A Charlie Brown Christmas with sponsor tag". June 26, 2013. ^ "A Charlie Brown Christmas - Original print vs. revised version". Vimeo. ^ "'TIS THE SEASON FOR HOLIDAY PROGRAMMING ON ABC". Disney ABC Press. Archived from the original on November 17, 2015. Retrieved November 15, 2015. ^ ABC announces 2015 holiday programming schedule Archived 2015-10-25 at the Wayback Machine. Moviefone. Retrieved October 27, 2015. ^ "WHV Press Release: Seasonal Family Classics Combo Packs (Blu-ray)". Home Theater Forum. ^ a b c Solomon 2013, p. 12. ^ Solomon 2013, p. 10. ^ Solomon 2013, p. 52. ^ Solomon 2013, p. 49. ^ Tribune-Star, Mark BennettThe. "MARK BENNETT: Album turns memories into musical Christmas message for Terre Haute's Dave Frey, band". Terre Haute Tribune-Star. ^ "A Charlie Brown Christmas". Tams Witmark. ^ Lukas, Paul (December 1, 2004). "Trees Made of Tinsel". Money Magazine. Archived from the original on 2012-07-17. Retrieved December 13, 2008 – via CNNMoney.com. ^ "A dark family secret: the artificial Christmas tree". East Bay Times. December 24, 2006. Retrieved December 13, 2008. ^ Pinto, Barbara. "Town Leads Aluminum Christmas Tree Revival", ABC News, December 18, 2005. Retrieved December 13, 2008. Bang, Derrick (2012). Vince Guaraldi at the Piano. McFarland. ISBN 978-0-7864-5902-5. Mendelson, Lee (2013). A Charlie Brown Christmas: The Making of a Tradition. It Books. ISBN 978-0-06-227214-0. Solomon, Charles (2013). The Art and Making of Peanuts Animation: Celebrating Fifty Years of Television Specials. Chronicle Books. ISBN 978-1-4521-1091-2.